Like John W. Campbell, Jr.'s "Who Goes There" or Jack Finney's The Body Snatchers, Richard Matheson's I Am Legend is a property that gets remakes/new adaptations every generation. 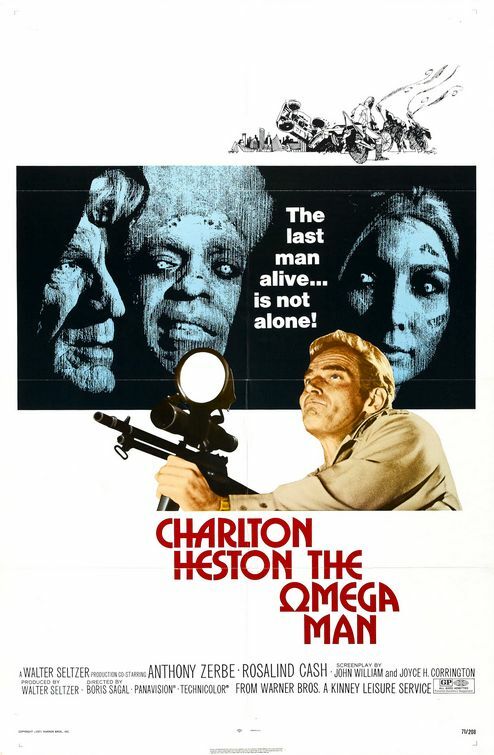 The Omega Man, 1971's adaptation of the material, follows 1964's The Last Man on Earth starring Vincent Price and precedes the 2007 Will Smith vehicle. There is also a 2007 Asylum mockbuster, I Am Omega, but we’ll ignore that for now. In this adaptation, Charlton Heston plays the role of Robert Neville, an Army Cornel who specializes in finding cures to biological warfare agents sent from the Reds (this is a Cold War era movie after all). During a just such a biological campaign of East vs. West (convenient! ), Neville utilizes an experimental vaccine that renders himself immune to an ailment that turns its infected into highly photosensitive albinos before finally killing them. It’s a mix of zombie and vampire myth, combined with a dose of the “albinos are evil” trope. As, the audience meets him in the beginning of the film, Neville has seemingly given up on finding a cure and spends most of his days in post-apocalyptic Los Angeles hunting down the infected in hopes of extermination. The infected themselves have banded into a cult called "The Family," and whose main religious belief is to destroy all knowledge of the modern world, presumably to prevent another global war. And thus is the subtext: a genocidal scientist versus a band of homicidal religious fanatics. The Scientist, being Charlton Heston, is ostensibly the film’s hero. For all of his flaws, Neville’s science is eventually shown to be the answer to the plague, rather than the Family's solution of ushering in a new Dark Age. It's not Shakespearean, but it's literate enough to be interesting. Other than being a Richard Matheson adaptation, the film is also notable for being one of the first mainstream US films to portray an interracial romance. Among the survivors Neville meets is Lisa (Rosalind Cash), a tough-as-nails love interest and sidekick - think of her as a Black Power Bond Girl. There are horror movies that are scarier and action films that have better pacing (and more ‘splosions) than The Omega Man - the pacing is almost glacial compared to today's 'more rapid the better' styles. It has its positives - it isn't afraid to portray Neville as potentially villainous and gave Black actors screen time and positive portrayals at a time when they often didn’t get either. But it also has it’s downsides – in addition to its slow pacing and slightly campy effects, its portrayal of albinos as diseased kind of negates some of the “social progress” factor of Rosalind Cash’s character. The Omega Man is a perfectly utilitarian horror film, especially when viewed through a historical lens.